The annual summer school of the Committee for a Workers' International (CWI) took place in Belgium during the week 12 to 17 July. Over 350 CWI members - many of them young people - came together from CWI sections worldwide to discuss the world economic crisis, the political situation in many countries, and workers' struggles across the globe. With global output already down by 3% and the world economic crisis far from over, mass unemployment and cuts in workers' living standards are major features of this period. All those at the school were united in the belief that capitalism offers a bleak future for billions of people on the planet, and that a transformation to socialist democracies with planned economies is the only way forward. The task is therefore to build the forces that can bring about this alternative. The CWI, basing itself on Marxist ideas, begins its international meetings by discussing and analysing current events in order to use this analysis as a guide to how workers' organisations can be built and armed with a socialist programme. Participants in the school particularly welcomed the recent European election victory of Dublin CWI member Joe Higgins. Joe attended the last two days of the school and spoke about his election campaign, having come straight from making his maiden speech - supporting workers across Europe - in the European parliament. The week included an inspiring evening public rally that focused on the fall of Stalinism in 1989, with speakers from Russia, East Germany, China, and a concluding speech from Peter Taaffe, general secretary of the Socialist Party in England and Wales. The thirty-plus sections of the CWI, whatever their size and stage of development, are all actively involved in workers' struggles in local communities and many are active participants, leaders in some cases, of nationwide struggles. The short reports on these pages give a glimpse of some of the work being done by only a few of the sections. See www.socialistworld.net for fuller reports and more information. Reporting by Bob Severn, Sarah Sachs-Eldridge and Judy Beishon. In Southern Ireland, the Socialist Party winning one of the three European seats in the capital city, was a magnificent achievement. Despite unemployment doubling in the past year to 12%, the Irish government has plans to halve social welfare and reduce the minimum wage. 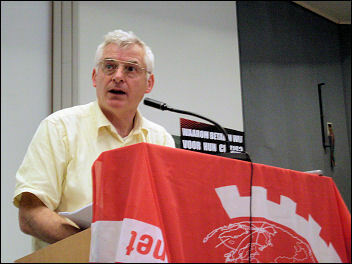 Joe Higgins' European election campaign, calling for nationalisation of the banks and a socialist Europe, struck a chord in its firm opposition to making working class people pay for the crisis. More than 50,000 first preference votes were earned by Joe and the Socialist Party during decades of campaigning against water charges, against bin taxes, against exploitation and in defence of the working class in Dublin. A poll of voters for Joe revealed that 48% voted for him primarily because he is seen as 'a fighter'. A further 18% said his membership of the Socialist Party was the main reason they voted for him - that's around 9,000 people in Dublin. A number of young people have recently joined the Socialist Party, having seen the method and ideas of the party in action in a campaign against university fees. Since the European election, six groups of workers have contacted the Socialist Party to ask for advice on their disputes. Overall, the election victory raises the profile of the Socialist Party in Ireland at a time when increasing numbers of workers are looking for ways to fight back. The MEP position is also a way for Joe to reach workers across Europe and internationally with the clear socialist programme of the CWI, and to actively support their struggles. Over the last 30 years Swedish Nazis have killed 30 people, including socialists, trade union activists, LGBT people and immigrants. One trade unionist was killed after exposing a Nazi in a workplace. This rise in violence and also confidence of far-right groups is linked to the electoral success of the Sweden Democrats (SD), whose statement of principles says: "The territorial boundaries of the state shall coincide with its demographic boundaries. In its ideal form, such a society is therefore ethnically homogenous." SD is a racist party which tries to hide behind a nationalist and conservative appearance. In 2006 they won 180 councillors in half of the local parliaments. The pro-capitalist parties have tried to undermine them by themselves calling for more repressive asylum and immigration laws. This has actually given the SD legitimacy. Alongside work on many other issues, the CWI in Sweden, Rättvisepartiet Socialisternas (RS), has been very effective in organising anti-fascist campaigns. A 500-strong counter protest organised by RS stopped the far-right Swedish Resistance Movement from marching in Gothenburg. But as a result of effective anti-fascist campaigning, far-right violence directed at RS has increased. In a vicious attack, one RS member, a Stockholm town councillor, was ambushed by three thugs with metal bars outside his home. Following a week of door knocking in the area, 200 people attended a public event against the attack. Every opportunity must be taken to expose and oppose far-right organisations, and the CWI puts an emphasis on building mass opposition among working-class people, as was also done in response to attacks on Roma people in Belfast. 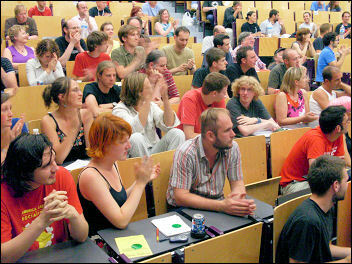 LSP/MAS (CWI section in Belgium) stood in the 2009 European elections to promote socialist demands among workers and young people. Through standing, LSP/MAS collected the details of over 3,000 people interested in joining the section or taking part in campaigning. These people were sent a weekly newsletter during the election campaign. Local branches of LSP/MAS are now focusing on recruiting the most active people who gave their details. Ten people have already joined in Antwerp due to this focus. Altogether, 40 people joined across Belgium during the election campaign. Weekly or fortnightly discussions are planned with these new members to help them become familiar with Marxist ideas and to become builders for the CWI. This year the Israeli section - Maavak Sozialisti (Socialist Struggle) - is marking its 10th year. After organising a very successful public 'Socialism' event towards the end of last year, the section was looking forward to carrying out its campaigning and recruitment plans. However, the brutal offensive of the Israeli army on Gaza at the end of the year meant that Maavak Sozialisti had to rapidly turn to campaigning against the war, through participating in demonstrations and organising street stalls and other activities. New members joined the section during the war, and the pace of recruitment has increased further during the first six months of 2009. As well as activity in local communities and shopping centres in some of the main cities of Israel - including Tel Aviv, Jerusalem and Haifa - Maavak Sozialisti has done important solidarity work during a number of workers' strikes. 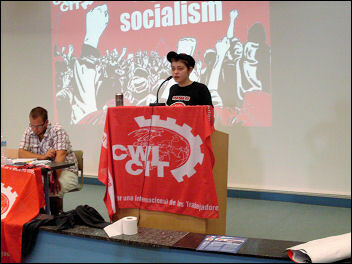 In Brazil, membership of the CWI increased in May with the Socialist Liberty Collective (CLS) merging with the CWI organisation Revolutionary Socialism (SR) to form Liberty, Socialism and Revolution. President Lula currently has around 80% electoral support. The world economic crisis has yet to fully hit Brazil; sales of goods such as cars are still increasing. However, unemployment is rising and a reduction in Foreign Direct Investment from western businesses will affect all of Latin America. Lula - a former trade union leader from a poor family and leader of the ex-left Workers Party - is currently the best political representative for capitalism in Brazil. Lula cannot stand for a third presidential term though and the groups within the government coalition are yet to agree a new candidate. While in the last presidential elections, the Party for Socialism and Liberty (PSOL) finished third with 6% of the vote, the future of this broad left party is unclear. There have been many arguments between groups within PSOL over the future of the organisation. LSR is part of a left bloc within PSOL, putting forward a bold socialist programme to challenge the current reformist leadership in order to attract workers and young people to PSOL. How does a small socialist group engage with a working class that has been severely let down by its left parties? This is the question posed for members of the CWI in Italy. The despair of the Italian working class has been graphically illustrated by the return of the hated right-wing Silvio Berlusconi to power - there was no one who workers and youth saw as worth voting for. Rifondazione Comunista, once part of the biggest communist party in Europe, saw its vote collapse after it participated in the enormously unpopular capitalist government of Romano Prodi. In the course of the activities of the CWI group in Bologna, the internationalism of the CWI has proved to be very attractive. On stalls, the group's members display papers from all the CWI sections and visits from CWI members in other countries have drawn people towards the group. Action on international issues, such as opposition to the war in Gaza and solidarity with the protesters in Iran, has shown how ideas can be put into action. A protest in support of the Iranian masses gained a good response. Social networking sites such as Twitter have proved useful, and engaging in debates at Bologna's 'speakers corner' has reached some who are searching for ideas and analysis. The CWI's clear programme of socialist struggle is enabling the CWI in Italy to increase its influence among workers in factories, shipyards, and many other working-class areas. So far in the world economic crisis, Australian workers have not faced mass sackings and closures, but widespread casualisation has allowed bosses to make vicious attacks like reducing hours with immediate effect. Over 27% of the Australian workforce is employed on a casual basis, over 60% of those are age 15 to 24. Most unions have done little to stand up for these workers. But members of the CWI in the Socialist Party, Australia, have been leading Unite, a small fighting union that represents fast food and retail workers. Unite is committed to abolishing youth wage rates, enforced casualisation and low pay. This new union has led some important victories, particularly of international students working at 7-Eleven shops. Following a successful campaign against a boss who was attempting to pay young workers in DVD hire instead of money, Unite was contacted by 7-Eleven workers, many of whom are students from India and China. In Geelong, near Melbourne, some workers were being paid less than two-thirds of the minimum wage and less than a third of the minimum legal Sunday rate. This brutal, profiteering company resorted to intimidation, including threats of deportation, in the hope that the campaign would subside. Far from it, as a result of Unite's bold media campaign, pickets and determination, 7-Eleven (Australia's 20th largest company in terms of turnover) was forced into retreat. Young workers in Sydney received back-pay of over $50,000 after a Fair Work Ombudsman's investigation prompted by Unite. To meet and feed the growing hunger for ideas on how to fight the crisis, the Socialist Party has employed 'new' media to help communicate 'old', but very important, ideas. Every Saturday, after their paper sale, the Melbourne branch runs a study group on Marx's Capital. Each weekly session comprises 45 minutes of watching David Harvey's Capital lectures on YouTube and 45 minutes discussing the ideas and theory. Gauche Révolutionnaire (GR, CWI France) has recently supported or taken part in massive strikes, including that of Goodyear tyre workers who have been striking for over two months against hundreds of redundancies. Consistent campaigning work at schools and colleges has led to many sympathisers taking part in such activities. In Rouen, GR now has student groups in nine schools and colleges, and has led strikes and demonstrations of over 3,000 students. Over the last year GR also has increased the number of student groups it has in Paris. Work in the Tamil Solidarity campaign in Paris has won support for GR in the city, resulting in 60 people recently attending a GR meeting there. In the Nouveau Parti Anticapitaliste (NPA), a new left party, GR has put forward the need for a clear socialist programme to attract workers and young people. This is gaining GR a national reputation as a class-based, serious organisation in the new formation, with the potential of helping to build a left bloc within the NPA. In the US, a right-wing radio DJ is attacking car manufacturers General Motors and Chrysler with the slogan "I will not buy a socialist car". This tirade is because the United Auto Workers union, which is linked to the Democrat party, now owns stakes in both companies. However, far from carrying out socialist policies, UAW has helped to bail out Chrysler by giving away union members' health benefits in exchange for stocks in the company which are now almost worthless. UAW's recent history includes allowing a 'second class' contract for new auto workers and eliminating sliding scales for wages. Socialist Alternative (CWI, US) members that work in auto factories are putting forward a real socialist plan, which would mean that struggling companies would be nationalised and converted to manufacture what society needs. In contrast, GM and Chrysler are closing factories and increasing unemployment. Socialist Alternative is encouraging rank and file factory workers to fight back, using the examples of the Visteon, Linamar and Lindsey disputes in the UK. SA aims to recruit more factory workers, as well as further building its base in schools and colleges. It is involved in a campaign against layoffs at Harvard university. Such campaigning will help towards the section's aim of doubling its size, and expanding from mainly being in northern cities to having branches across the whole country. The German economy is deteriorating fast - GDP is expected to fall by 6-7% this year and unemployment is rising. In response, there have been a number of workers' demonstrations in recent months and, after September's election, there is a possibility that attacks on living standards could provoke a general strike, which would be the first for over half a century. The capitalist class is using the 20th anniversary of the fall of the Berlin wall to claim that there's no alternative to their system, but many people are interested in socialist ideas. In this situation, Die Linke (the Left Party) should be striding ahead, but it only gained 7.5% of the vote in the European election, half the 15% it was getting in polls 18 months ago. Its leaders have a mainly parliamentary orientation and do not utilise the capitalist crisis to argue for a clear socialist position. In June, SAV (CWI, Germany) successfully retained its council seat in Rostock against competition from Die Linke and this campaign has been the excuse to exclude five leading SAV members from Die Linke membership. However, SAV will continue to work to build Die Linke, arguing for it to adopt socialist policies. Reflecting the support that SAV itself is building up, after speaking at SAV's annual Socialism event, the chairperson of the Left Party in Bavaria wrote that SAV shows a preparedness to change the political system in Germany and could be the decisive force in changing society in the future.